Anna Soulliere did a great job of hiding in the records, but I finally found her baptism record. A couple of days ago, while looking at a marriage record for her sister Ida from 1896, I found that one of the witnesses to the marriage was “Mary Smith”. Mary? That was the name on the 1880 birth record for Charles Kliber, who I thought might be my great-great grandfather, Charles Leon Schmitt. I went looking through the Drouin Collection records (Roman Catholic records from French North America collected by a company that sold genealogies) on Ancestry again, using “Marie Anne Soulliere” as a search term. Still no luck. So I kept searching for records on Ancestry.com for her siblings. In the search results for one of her siblings, one odd listing came up for “Marie Bech”, baptised in 1852 in Sandwich, Ontario (now part of Windsor). When I looked at the record, it was clear that the name and date had been incorrectly transcribed, and that what I was looking for was my missing 3G grandmother. Then there’s some less readable stuff about the Godparents. 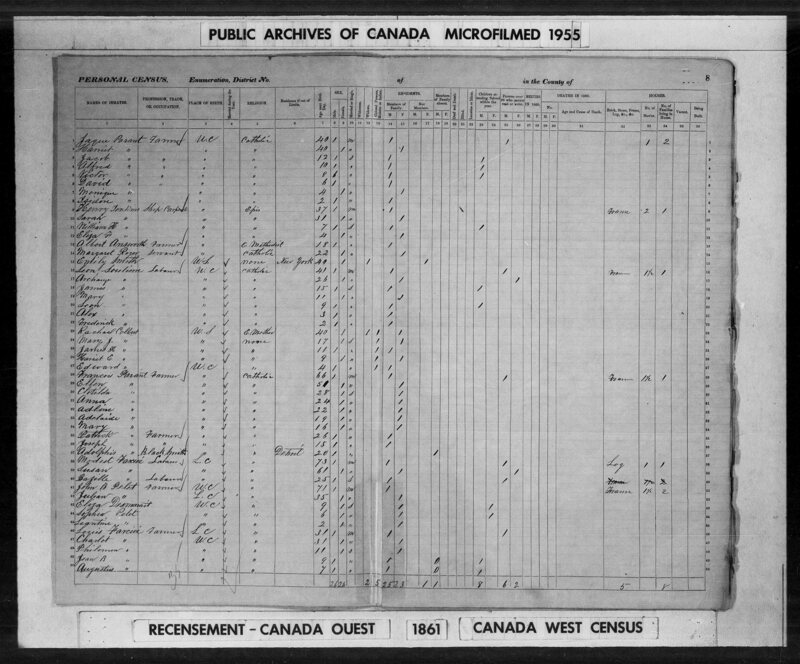 Being born on 2 October 1861 was a couple of months too late to show up on the 1861 Census of the Leon Souliere family in Sandwich East, Canada West (the name of Ontario before Canada became a country in 1867). And by the time the family showed up in the 1880 Census in Grosse Pointe, she had moved out and was presumably living with her husband and newborn son. I’ve never found the Soullieres in the 1870 or 1871 Censuses. So Marie Archange “Anna” didn’t show up as part of the family in a lot of the standard references like the book from Father Dennison I mentioned in my previous post. But there she was in the church records. The fact that she apparently also used Mary as her name at points in her life, as evidenced by her name as a witness on her sister Ida’s marriage record, leads me to conclude that Charles Kliber, born on March 13, 1880 to Charles Kliber, machinist (the same profession ascribed to him in records for Minnie and Stella with Anna listed as mother), and Mary Kliber, is in fact my great-great grandfather Charles Leon Schmitt. I don’t know when and where she died. The last record I have of her is when she’s listed as a still-living spouse on the death certificate of her third husband, Joseph Stanley, in 1929. It’s taken me twelve years to untangle the story of Marie Archange “Anna” Soulliere.